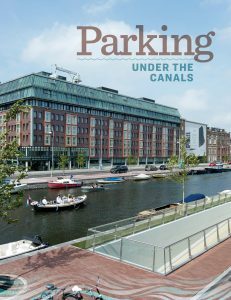 Where do you put parking in a town crisscrossed by canals when almost all the land is spoken for? Under water. Of course. That’s exactly what happened in De Pijp, Amsterdam, established in the 1880s and waterlocked, so to speak. It’s a popular destination for both tourists and people eager to live in its quaint houses, and its streets became clogged with parked cars. So architects and designers did the most logical thing: Eased the parking crunch with a new structure built underneath the town’s canals. The resulting Albert Cuyp Parking Garage is light and bright inside, holds 600 cars and 60 bicycles, and is a bit of an engineering marvel. It’s the first garage of its kind (we think it’s pretty awesome!) and, some hope, one of many to come that will use underwater space for parking. The Parking Professional features this garage and explains how it was designed and built and how it’s used in daily life, with plenty of photos. Read the whole story here. Then let us know in the comments: Is this the wave of the future?